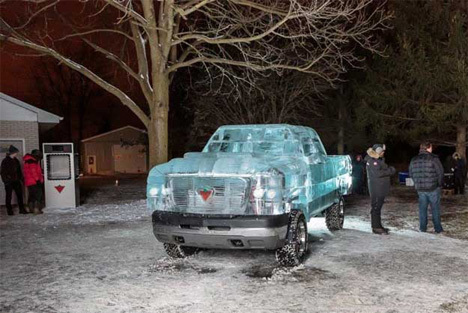 As one of the worst winter storms in recorded history battered Canada in late 2013, Iceculture was purposely exposing themselves to thousands of pounds of ice in the name of their cold, cold art. The ice truck above was once a 2005 Chevy Silverado before the body and cab were removed. Since the finished ice truck would weigh in at over 15,000 pounds, a reinforcing steel frame was installed. Then, Iceculture got to work cutting carefully-designed pieces of ice with a CNC machine. The team used water to “weld” the pieces together. 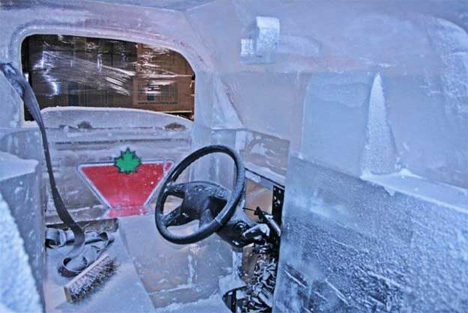 All told, three of the ice trucks were created: a prototype, a display model, and one that actually drives. 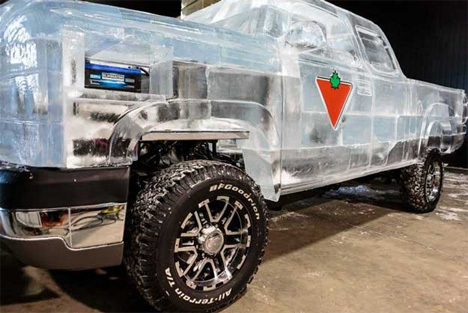 The ice truck was originally commissioned for an advertisement campaign for a tire brand. After the commercial was shot, the truck was disassembled and shipped back to Iceculture for another important project: setting a brand new Guinness world record. It was reassembled and driven for one mile, then left to melt over a period of 40 hours. See more in Art Vehicles or under Transportation. January, 2014.